The view of the Earth from outer space. Assemblage of the spacecraft on the Earth, there are scientists and cosmonauts Kubasov VN and Remek V. Cosmonauts Grechko GM, Bykovsky VF, Germashevsky M., Ian Z., Rukavishnikov NN in training. Cosmonauts Grechko GM and Romanenko Yu. V. in spacesuits before the State Commission. The launch of the Soyuz-26 spacecraft with cosmonauts Grechko GM and Romanenko Yu. V. on board. Astronauts Yeliseyev AS and Feoktistov KP in the MCC. space ship "Soyuz-26" in flight. Docking of the Soyuz-26 spacecraft with the Salyut-6 orbital station. Astronauts Grechko GM and Romanenko Yu. V. on board the station 'Salyut-6'; sunset. Cosmonauts Dzhanibekov VA and Makarov OG onboard the Soyuz-27 spaceship. Grechko GM and Romanenko Yu. V. on board the orbital station 'Salyut-6'. Refueling the Progress spacecraft with fuel, loading the Progress spacecraft with old equipment from the Salyut-6 station. Astronauts Grechko GM, Romanenko Yu. V., Dzhanibekov VA and Makarov OG on board the station "Salyut-6". Medical examination of astronauts on the ground. Astronauts AA Gubarev and Remek V. before the State Commission. Specialists observe the flight of the Soyuz-28 spacecraft, there are cosmonauts Volynov B.V. and Zudov V.D., Gubarev A.A. and Remek V. on board orbital station Salyut-6, medical examination of astronauts aboard the station, device Oximeter. View of the Earth from space, sunset. 'Soyuz-27'. Refueling the spacecraft 'Progress' with fuel; loading the spaceship Progress with the old equipment from the Salyut-6 station. Astronauts Grechko GM, Romanenko Yu. V., Dzhanibekov VA and Makarov OG on board the station 'Salyut-6'. Specialists observe the flight of the Soyuz-28 spacecraft; cosmonauts Volynov BV and Zudov VD, Gubarev AA and Remek V. are present aboard the Salyut-6 orbital station; medical examination of astronauts aboard the station, device 'Oximeter'. View of the Earth from space, sunset. Spacecraft Soyuz-27 in flight after undocking with the orbital station Salyut-6. A search group near the descent vehicle, cosmonauts Grechko GM and Romanenko Yu. V. after landing. Space ship 'Soyuz-29' at launch, Baikonur cosmodrome. Cosmonauts Kovalenok VV and Ivanchenkov AS in the ship 'Soyuz-29', work with on-board documentation. Cosmonauts Klimuk PI and Hermaszewski M. during preflight training in the Star City. Klimuk PI and Hermaszewski M. go to the cosmodrome. The Soyuz-30 spacecraft in flight. Cosmonauts Kovalyonok VV, Ivanchenkov AS, Klimuk PI and Hermaszewski M. aboard the Salyut-6 station, carrying out the experiments "Taste" and "Leisure", broadcasting the concert on board the station Salyut-6 '; negotiations with relatives of astronauts. Cosmonauts V.V. Kovalenko and A.Ivanchenkov unload the Progress-2 spacecraft. The exit of Ivanchenkov AS into outer space. Astronauts Grechko GM and Eliseev AS in the MCC. Cosmonauts Bykovsky VF, Ian Z. and their backups: VV Gorbatko and E. Kellner at Baikonur. The State Commission at the cosmodrome. Spacecraft Soyuz-31 with cosmonauts Bykovski VF and Ian Z. in flight. Cosmonauts Kovalenok VV, Ivanchenkov AS, Bykovsky VF and Ian Z. aboard the station 'Salyut-6'. Cosmonauts Kovalenok V.V. , Ivanchenkov A.S. , Bykovsky V.F. and Ian Z. on board the station 'Salyut-6': work with on-board documentation, performing physical exercises. View of the Earth from space: oceans, clouds, cyclones. 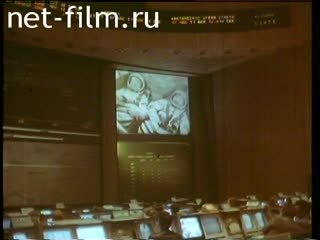 Astronaut Eliseev A.S. in the MCC. Landing of the descent vehicle with cosmonauts V.V. Kovalenko. and Ivanchenkov AS The Kremlin, General Secretary of the CPSU Central Committee Leonid Brezhnev. presents awards to cosmonauts V.V. Kovalenko and A.Ivanchenkov, G.T. and Klimuk P.I.